Dodonaea filiformis is a moderately uncommon but widespread species in dry forests. 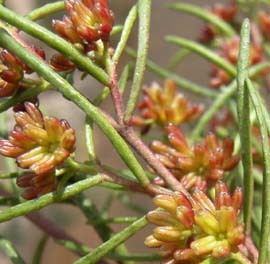 It is a medium sized, erect native shrub with very narrow, somewhat sticky leaves typically a couple of cm long. 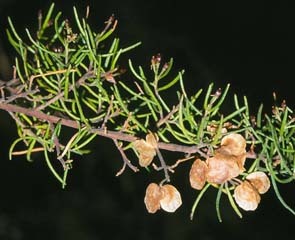 The three-winged fruit are unique to this species and its more common relative, D. viscosa.